This is this year’s minimalist altar for my departed: husband Bob, Mother Pat and Father Ben. I wasn’t going to do one. 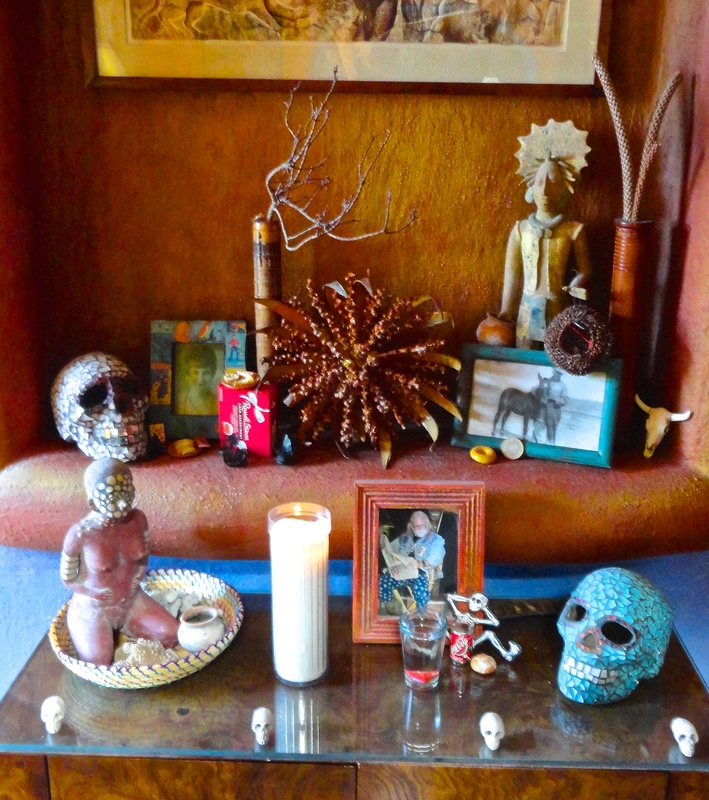 Then Yolanda (my housekeeper) told me about a friend who didn’t make a Dia de los Muertos altar for her mother who had recently died. This friend then went to see the elaborate offerings of her brothers and sisters, so she brought a rather poor specimen of a pumpkin and told them they could put that on her mother’s grave. That night she had a dream of walking through the graveyard. Every other grave was elaborately decorated with flowers and sweetly-scented candles and favorite foods of the departed: water, whiskey, tequila. When she got to her mother’s grave, there was no light and there were no offerings—only the one poor pumpkin. As she walked by, people shook their heads, and she left in shame. When she woke up, she went to her mother’s grave and took her fresh water, a candle, sweets, and all of the things her mother loved. It worked. I assembled an altar. 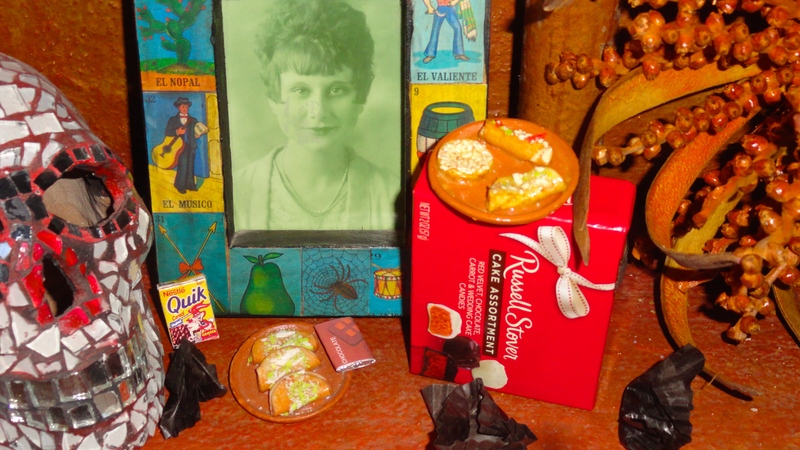 Yolanda looked at it and told another story about how the water and candle help to create a breeze that brings the scent of the favorite foods to the departed. 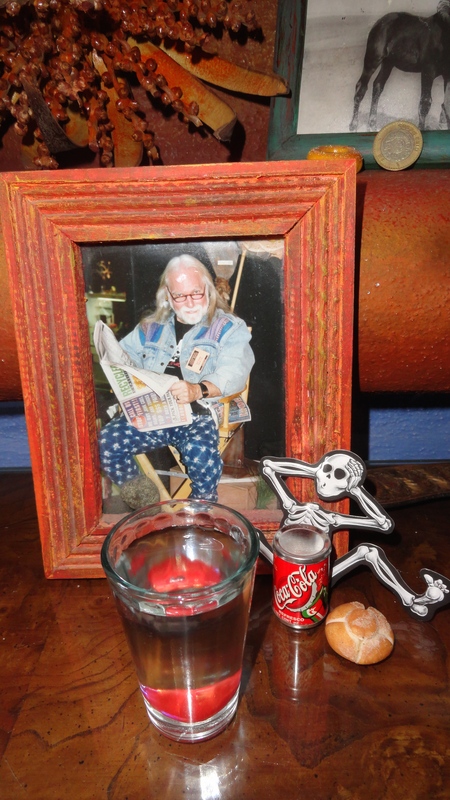 I quickly added a candle and a small glass of water with an ice cube—as Bob did hate a lukewarm Coke! When the ice cube melted, I added a small red heart to take its place. If you look closely, you can see it in the bottom of the glass. 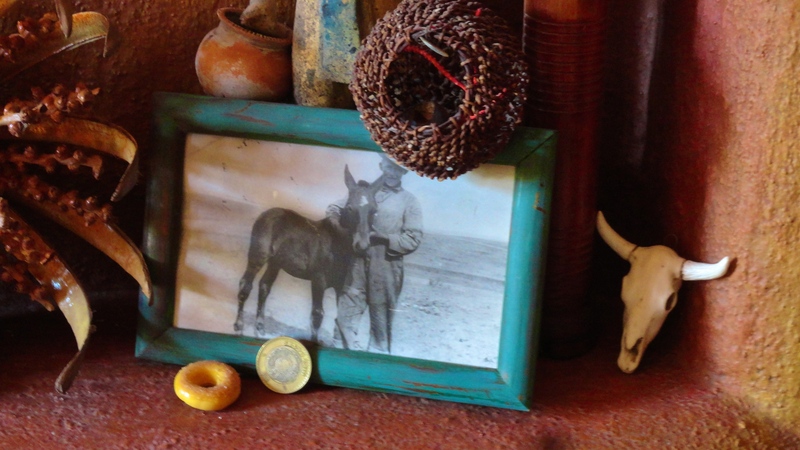 Although my father raised black Angus and Hereford cattle, this is Mexico, after all, so I think he’d forgive the long horns. A donut and a 10 peso piece complete his offerings. Last year I put a small glass of milk with cornbread crushed in it—his favorite cocktail. But this year the ants have taken over our part of Mexico, so I didn’t dare. This entry was posted in Altars, Death of a Loved One, Dia de los Muertos, Family, Fathers, Memorials, Mother, Mothers, Nostalgia and tagged Altars, Death, Dia de los Muertos, Essays, Family, family memories, love, Memorials, memories, Shrines, Tradition on November 1, 2014 by lifelessons.